"I am passionate about functional, beautiful kitchens! The way you cook and entertain are critical to a great design. When we meet, I'll have a lot of questions. And when you talk, I promise to listen! I want to make this your dream kitchen, no matter what the size. Let's make sure that you have the features that every great kitchen needs, such as a pantry with roll-out trays, triple drawer pots and pans cabinet, a storage place for baking sheets and one for spices, a corner lazy susan, plenty of wall storage close to the dishwasher and a two-tier silverware drawer to maximize storage. A panel beside the refrigerator gives it a finished, built-in look, with the cabinet above 24” deep. The idea is that you spend a lot of time working in this kitchen, so let's give you the tools you need." 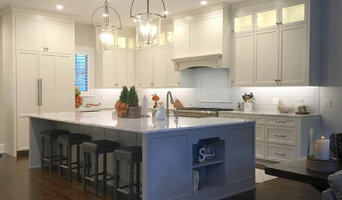 Jim Spence Design specializes in one kitchen at a time. Jim has 39 years experience in the kitchen remodeling business combined with finish carpentry and trim. He works closely with his clients and shares his drawings throughout the process so that the client has a great deal of input. The ultimate goal is to make sure that the client achieves the kitchen that works perfectly for their individual needs. Jim has a team of contractors with whom he has worked for 10-20 years, so he can bring in specialized craftsmen for all aspects of the project. We look forward to designing your dream kitchen with you! Masterpiece Closets has been designing and installing custom closets, garage systems, pantries, laundry rooms, home offices, and other storage spaces for over 30 years. Whether you’re looking to create small functional spaces or create custom storage for your entire house, Masterpiece Closets has the skill and the experience to take your project from beginning to end. The Company was started by Wayne Clark who recently partnered with Ted Wettstein in order to provide more depth to accommodate the Company’s growth. Wayne has over 30 years of experience in the industry and Ted has over 35 years of experience in accounting, financial management, strategic planning, and design. Along with Cris Smith who has over 10 years of industry design experience, the team is well positioned to handle any storage project. Our Process Step 1.Schedule Free Consultation. A talented designer will meet with you in your home to discuss and listen carefully to your needs and ideas, take detailed measurements, and conceptualize your storage solutions. Step 2. Review the Design. We will create a custom design for your review including pricing. Together we will review the design, make any adjustments that are desired, and provide a final price designed for your budget. Included in the design will be the selection of accessories, colors, finishes, and hardware. Step 3. Custom Crafted. When your custom design is complete and your proposal signed, it will be produced to the exact specifications of the design. Step 4. Quality Installation. Your new closet and storage solutions will be installed at a convenient time by treating your home with the up most respect. The job will not be complete until you are totally satisfied. The Closet Monkey delivers residential and commercial storage and organization solutions. With over 15 years of experience in custom cabinetry and installation we utilize industrial grade melamine for structural support. Our hanging poles are constructed from steel or aluminum to ensure longevity and we use screws instead of cams for better construction. Our commitment to the product and your complete satisfaction ensures a lifetime warranty on materials and installation. At Closet Factory Orlando we immerse ourselves in each project, from simple to sensational. We have a great team of designers and craftsmen who work closely together to ensure you get the organization results you seek. We specialize in closet systems of all sizes, pantries, home offices, craft rooms, garages, wall-beds and much more. Our name says closets but we are all about solutions for every room. We are very active within the design and home building trade and are members of the American Society of Interior Designers (ASID), the Northeast Florida Builders Association (NFBA) and the Home Builders Association of Metro Orlando. A few years ago we created a state-of-the-art wine cellar and tasting area for the New American Home at NAHB’s International Builders Show. The director of the project said it “became one of the most popular features of the home and certainly one of the most visited rooms.” Participating in trendsetting projects like these make us even better at our work for you. We offer security as a licensed, bonded and insured business, dedicated to the community by making all of our products right here in Orlando. Our showroom is located in Maitland and our factory is in Longwood. We support many events and causes in our area, including the Orlando Museum of Art and numerous children’s charities. We invite you to visit us anytime or give us a call to schedule a free consultation with one of our designers. It is through a fierce passion to serve, integrity, commitment to excellence, and the finest design and craftsmanship that we work to be Central Florida’s leading provider of custom cabinetry. We would welcome the opportunity to earn your trust and deliver you the best service in the industry by: - Creativity, originality, and devotion in crafting affordable custom cabinetry designs. Knowledge in building structure, mechanical, electrical and plumbing systems, building codes, and NKBA guidelines. - Persistence in creating Universal Designs that balance safety, function, and beauty. - Dedication in using Eco friendly materials and procedures. - Effective communication and superior customer service skills. Call us today for free consultation in your home. BelleDangles are jewelry organizers that display and organize all of your jewelry and accessories making your collection easy to find, untangled and clutter free. BelleDangles Jewelry Organizers hold over 110 pieces of jewelry tangle-free including: - Necklaces - Bracelets - Rings - Both Stud & Dangle Earrings - Accessories including: scarves, hats, belts, hair ties and handbags. Unlike jewelry boxes, BelleDangles Jewelry Organizers keep jewelry and accessories in their place solving the issue of tangled necklaces and missing earrings. Plus, because it is displayed on the wall, it saves space on dressers and counter tops. 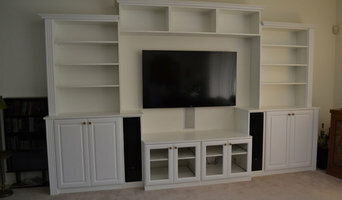 OUR STORY Add instant organization to your home with custom closets from Closet Envee. Based in Winter Park, we serve homeowners throughout central Florida. Backed by more than thirty years of experience, we know how to meet your home organizing needs. Our experts strive for 100% satisfaction and offer personalized attention from start to finish. OUR MISSION To meet all the home storage and organization needs of our clients by providing creative designs, quality products, professional installation and exceptional customer service for custom closets, wall beds and cabinet installations in Central Florida and surrounding areas. Decluttering, minimizing, and organizing residential space is what Sabine Lay Professional Organizing specializes in. The goal is to create a home for the things you love. SLPO brings order to spaces, which includes the living room, kitchen, home office, closet, and other desired areas. Visit www.sabinelayprofessionalorganizing.com and book your free consultation. ShelfGenie of Orlando custom designs, builds and installs pull out shelves to fit the existing cabinets and closets in your home, creating better visibility, easier access and improved organization throughout your entire home. ShelfGenie is a national franchise that provides homeowners with organizational Solutions, like Glide-Out™ shelves. Our Solutions bring more space, access, and organization to clients’ homes across the U.S. and Canada. Each of our Solutions are custom made and handcrafted to find our clients’ existing cabinets. This allows our clients to transform their space without having to get a renovation. Our Solutions make each of our clients’ lives easier, and help them to truly love their space. Central Florida's leading Organization system provider for decades. Closets by Design has serviced Central and North Florida since 2003, with the National Franchise system starting in 1982. We only use the best materials, which are commercial grade. and we never subcontract. So when you work with Closets by Design, you are working with 100% employees from Closets by Design, who will be there to help with the next project for years to come. Our manufacturing facility in Orlando is second to none, with over 20,000 sq ft to provide you with the perfect custom project. And by custom, that means any dimensions you want. We don't group sections into common lengths to preorder from a manufacturer. This is one of the many benefits of working with Closets by Design...we actually manufacture your custom project here to your specifications and within your budget. So don't delay, call us today for a Free, No Obligation Estimate...! 3 Day Closets is a professional closet and home storage systems company. Our philosophy is, "Life is short...get organized!" What do Orlando, FL professional organisers and storage designers do? A Orlando, FL professional organiser can declutter your home and help you organise your possessions and furniture in a way that fits with your design vision. A home storage designer, on the other hand, can be hired to design custom wardrobes, shelves or other storage solutions to give you the exact storage space you need in your home. Some Orlando, FL professional organisers will be able to coach you in how to declutter your life, as well as your home, so that you will learn how not to clutter or hoard anything in future. This is a great idea if your home is in need of a complete overhaul and you think that you have a problem with clutter and letting go of old possessions. Or, perhaps you have one particular room that has become overcrowded with clutter, such as the spare room, office or utility room, and needs some serious decluttering attention from a professional. Moving house is always a stressful time and can be made worse by having to deal with all the clutter, jumble and bits and bobs, so it could be worth hiring a professional organiser in Orlando, FL to help you with your move and make sure your new home looks neat and tidy in no time. You can search for Orlando, FL professional organisers with Houzz, see their previous projects and read reviews online before you contact them about your project. If you’re thinking of hiring an Orlando, FL storage designer or professional organiser when moving into a new home, you may want them to discuss your design ideas with any other professionals working on your house project to make sure your storage solutions work with the rest of your design. Here are some related professionals and vendors to complement the work of home storage designers & professional organisers: Interior Designers, Furniture & Home Accessories, Design & Build. Find a professional Orlando, FL professional organiser or storage designer on Houzz. Narrow your search in the Professionals section on Houzz to Orlando, FL storage designers and organisers or look through storage and wardrobe photos and contact the professionals that worked on them.